Not all adolescents have the same needs, face the same risks, constraints, and deprivations and require the same services. For example, very young adolescent girls in many settings are often compelled to absorb social and gender norms requiring them to marry. Married adolescent girls are expected to produce a baby as soon as they get married. This paper explores how Interventions that help girls stay in school and equip them with agency and capabilities are critical to keep girls out of marriage and pregnancy. The paper examines non health sector interventions that are proven to have an impact on preventing poor health outcomes on adolescents and also suggests policies that can help protect the health of adolescents. To facilitate a healthy transition from adolescent to adulthood, three key interventions are vitally important: 1. health education including comprehensive sexuality education with a focus on gender equality and human rights; 2. access to health services including sexual and reproductive health and 3. making environments safe and supportive. An analysis of the health challenges faced by adolescents today was undertaken by looking at major burden of diseases, global mortality and morbidity data, as well as major social and economic determinants of adolescent health. Injuries and violence, mental health, communicable and noncommunicable diseases, maternal mortality and morbidity, HIV-AIDS are the major areas that require specific interventions from the health sector. After looking at trends, a conclusion is made about priority interventions by the health sector to ensure that adolescents are able to give voice, choice and control over their own bodies. Health sector interventions recommended include health education including comprehensive sexuality education, access to integrated health services, immunizations and nutrition. Background: The USAID-funded Expanding Maternal and Neonatal Survival (EMAS) Program supports reductions in maternal and newborn mortality through improving facility-based quality of care and by strengthening district-level referral systems. The project operates in 150 hospitals and 300 health centers across the 30 districts in Indonesia with the largest proportion of maternal and newborn deaths. Methodology: Each month, EMAS supports the routine collection and reporting of evidence-based MNH interventions in health facilities, including ACS for preterm deliveries, MgS04 for PE/E, and uterotonic for the 3rd stage of labor. District-level maps are created for each of the six MNH interventions to display the proportion of women and newborns who receive care. Graphics are also created to display achievement of EmONC performance standards alongside related MNH outcomes. Results: Data visualization, including mapping, is incorporated into routine analyses and results dissemination to more efficiently and effectively communicate about programmatic performance. For a decentralized program such as EMAS, maps have been especially useful to articulate the relative performance of districts. The availability of relevant data, in which program staff have confidence, has been key for visualization products to influence decision-making. Conclusions: In Indonesia, the EMAS program has successfully introduced the routine collection of MNH intervention data and is using visualization to communicate about related outcomes. Effective use of this information requires continuous efforts to strengthen data quality as well as the capacity to analyze, display and interpret results. Background: Most maternal, perinatal and neonatal complications and mortality occur at or shortly after labor and delivery. In order to significantly impact maternal and newborn mortality and attain the MDGs and SDGs, India has implemented various strategies to promote skilled birth attendance and incentivize institutional deliveries. Objective of this presentation is to present the trends in maternal, perinatal and neonatal deaths in Belgaum district of Karnataka, India. Methods: Maternal Newborn Health Registry (MNHR) of the Global Network for Women’s and Children’s Health Research is a prospective ‘Pregnancy Tracking System’ to quantify the trends in pregnancy outcomes in low-resource settings, and provide population based statistics on stillbirths, and neonatal and maternal mortality. An annual household survey of Married Women of Reproductive Age (MWRA), adapted from the Ministry of Health’s Eligible Couple Survey, identifies women who are currently pregnant and those who are likely to conceive. Comparing projected and actual enrollments confirms completeness of the registry. Consenting pregnant women who are permanent residents of the area are enrolled. Follow-up visits are completed at delivery and 42 days postpartum. Results: The MNHR has captured 82,275 pregnancy outcomes from 2009 to 2013. 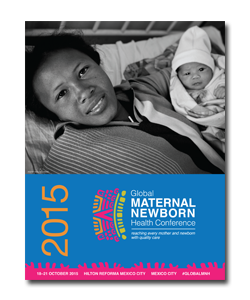 During this period, maternal deaths decreased from 34 out of 14,921 live births to 13 out of 15,718 live births. Similarly, the PMR declined from 46.0 to 33.4 per 1000 births. However, Early (7-day) Neonatal Mortality (20.9 to 18.1 per 1000 live births) and 28-day Neonatal Mortality (26.0 to 23.2 per 1000 live births) have remained unchanged. Conclusions: Mapping visualizes the distribution of maternal and newborn deaths in geographical areas and their relationship to health facilities. MNHR model, supported by a simplified household survey of MWRA, could form the basis for a national vital registry system. It can assist policy makers to assess health care needs and implement targeted interventions from pre-conception to postpartum period. Background: Since 2007, Mozambique has seen substantial improvements in the institutional delivery rate, met need for emergency obstetric care (EmOC), population-based cesarean delivery rate, and the direct obstetric case fatality rate; though, the number of functioning EmOC facilities declined. Even with this progress, availability of and access to some critical life-saving interventions remains inequitable. We investigate geographic access to EmOC services in 2012 and, through spatial modeling, explore how resources, e.g. ambulances, referral infrastructure, and functioning EmOC facilities, could be better distributed to improve geographic equity in EmOC access. Methodology: We use multiple spatial data sources including population, expected births, land cover, and road networks, as well as Mozambique facility-level data from 2012 on provision of EmOC services. In ArcGIS, we model multi-modal travel times to various service levels: 1) home to first level, 2) home to functioning comprehensive EmOC, and 3) transfer times between service levels. Finally, we propose improvements to the distribution of resources and model resulting changes in geographic access. Results: We present national level results for 2012 that: (1) quantify access to EmOC, measured by the percentage of the population with timely access to functioning EmOC services; (2) identify geographic areas with poor access to EmOC and describe the referral readiness of lower level health facilities in these areas; (3) locate health facilities with critical referral infrastructure, and present a reconfigured system with referral resources distributed to maximize EmOC access; and, (4) for each proposed system improvement, summarize marginal changes in percent of the population with access to each service level. Conclusion: Modeling geographic access to health services within a GIS is a powerful tool that can inform health planning at the national and sub-national levels. The methodology facilitates testing the impact of system improvements as well as planning with critical sectors beyond health such as roads and transportation. Background: Early adolescent pregnancy presents a major barrier to the health and wellbeing of young women and their children, as recognised by international agreements and goals. Localized pockets of spatial inequalities likely reflect underlying levels of deprivation, as well as access to reproductive health services. The use of spatial statistics has therefore become an important tool in guiding policy decisions and focusing resources, particularly in the post 2015 Sustainable Development Goals era. This research demonstrates how a range of geospatial tools can be utilised to illustrate regional patterns of adolescent first birth using national household survey data. Methods: The most recent Demographic and Health Surveys (DHS) among women aged 20 to 29 in Tanzania, Kenya, and Uganda were utilised. Prevalence maps were created from the GPS-located cluster data utilising adaptive bandwidth kernel density estimates. To map adolescent first birth with estimates of uncertainty, a Bayesian hierarchical regression modelling approach was used, employing the Integrated Nested Laplace Approximation technique. Results: Heat maps were produced quantifying regional heterogeneity of adolescent first birth. Marked geographic patterns were observed throughout the region, with increased prevalence of first birth under 16 years in Kenya and Uganda. Heterogeneity was also observed across age class, with greater variation among younger adolescents. Maps of predicted prevalence are also presented, and emphasize within-country heterogeneity across neighbouring districts. Conclusion: The growing availability of comprehensive, geo-referenced data from sources such as the DHS suggests continued opportunities to improve mapping of adolescent motherhood and other MNH indicators. These results illustrate the utility of spatial statistical methods in visualizing the health and wellbeing of women and children, and can be used to identify areas of high need or target resources. Such approaches will increasingly become an important tool for informing policy and making evidence-based decisions. Background: Advancing the health and wellbeing of women and children remains an important focus in the post-UN Millennium Development Goal era, with many of the proposed Sustainable Development Goals concentrating on maternal and newborn health (MNH). To accelerate achievement of these upcoming goals, researchers have begun calling for the disaggregation of national-level MNH data, elucidating pockets of regionalized disparities and allowing for focused advocacy and equitable improvement for all women and children. Methodology: Here we utilize spatial statistical methodologies and Bayesian regression techniques to map disaggregated skilled birth attendance in Burundi, Kenya, Rwanda, Tanzania and Uganda. Most recent household survey data, UN statistics, and other data sources representing population distribution, subnational age structure, fertility and growth rates were utilized to estimate births and pregnancies. Skilled birth attendance was modelled utilizing the Integrated Nested Laplace Approximation technique in R software and national household survey data. Additional data layers such as travel time to facilities were quantified using geo-referenced health facility data via EmONC. Results: Distributions of women of childbearing age, births and pregnancies were mapped at 100m resolution for each country. Maps of disaggregated skilled birth attendance were also built for the region, including antenatal and perinatal attendance. These spatial layers were combined to illustrate regional unmet skilled birth attendance need, emphasizing local heterogeneity and highlighting areas of highest need for MNH services and advocacy. Conclusion: The results of this research produce novel, high resolution surfaces of skilled birth attendance, including antenatal and perinatal attendance, highlighting subnational heterogeneity throughout East Africa. These findings begin to fill a critical knowledge gap regarding where and to whom subnational disparities are occurring. This has important policy relevant implications and may be used to inform targeted resource allocation, as well as predict related MNH outcomes such as neonatal and maternal mortality. 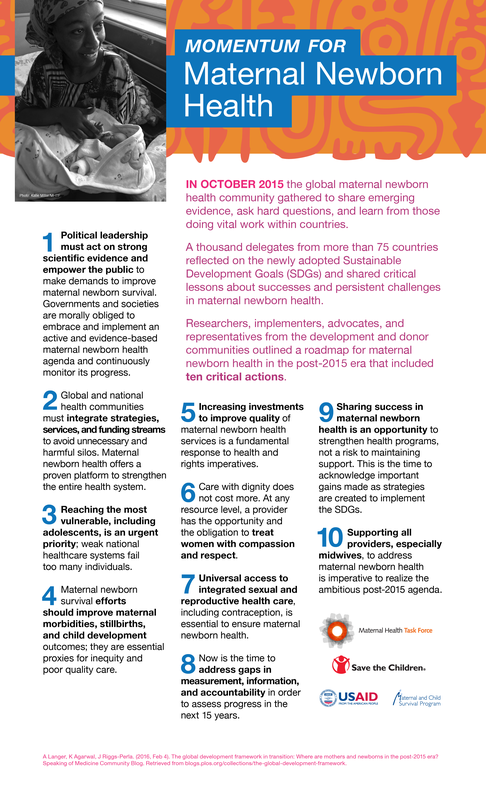 Background: Ending preventable stillbirths and neonatal deaths forms a significant part of the global agenda beyond 2015. The first step in targeting programs that aim to address perinatal mortality is accurate capture and classification of the causes of those deaths across all settings. Methodology: Modelled on the WHO Application of ICD-10 to deaths during pregnancy, childbirth and the puerperium (ICD-MM), and following systematic reviews and technical consultation, the WHO, in collaboration with partners, has developed the WHO Application of ICD-10 to perinatal deaths (ICD-PM), which aims to facilitate the consistent collection, analysis and interpretation of information on perinatal deaths. Results: ICD-PM has three distinct features, building upon reportable variables in ICD-10 for perinatal deaths, leading to tabulation of cases such that comparability between settings is possible. First, it captures the time of a perinatal death (antenatal, intrapartum, neonatal). Second, it applies a multi-layered approach to classification, such that it reflects varying levels of available information. Great consideration has gone into ensuring ICD-PM is applicable in low resource settings where the burden of mortality is greatest, and also in high resource settings, where mortality is lower but still present. Third, ICD-PM links the contributing maternal condition with perinatal death. Capturing the chain of events that led to the perinatal death, from the maternal and the perinatal side, informs the design and development of preventative and therapeutic measures. Doing this imparts benefit to both mother and baby should we advocate for programs aimed at one unifying pathology or clinical scenario. We are undertaking ICD-PM field testing on South African and UK data, and the results of this will be presented. Conclusion: Perinatal mortality remains unacceptably high and we must unify our approach to classifying these deaths, using this information to drive interventions and allocate resources to end preventable stillbirth and neonatal death.